While most physicians and lay people know terms such as the anterior cruciate and posterior cruciate signify ligaments of the knee, most are not as familiar with the term arcuate ligament. The arcuate ligament is a Y-shaped condensation of collagen fibers that courses from the fibular head, over the popliteus to insert on the posterior capsule. (See Figure 1.) Its medial limb joins the fibers of the oblique ligament and is firmly attached to the musculotendinous junction of the popliteus muscle. It lies just behind the lateral collateral ligament and along with it, provides posterolateral stability to the knee. Figure 1. Anatomy of the posterior right knee. The arcuate ligament is one of many structures providing posterolateral stability of the knee. Any injury or trauma to the lateral side of the knee is likely to injure the posterolateral knee structures. This can occur with a direct blow to a flexed knee while the tibia is externally rotated or a blow to an extended knee with the tibia internally rotated. Rarely is the arcuate ligament injured just by itself. When cruciate ligaments are also injured, typically these are addressed first. In fact, clinically unrecognized posterolateral injury has been suggested as a cause of post-surgical cruciate ligament failure or chronic instability of the knee. Besides physical examination, sometimes MRI is necessary to delineate the extent of the injury.1 It is important for the Prolotherapy doctor to know about the arcuate ligament because posterolateral rotator instability of the knee is easily missed, misdiagnosed, and mistreated. JH injured her right knee by stepping over a threshold, where she felt her knee go out with pain in the posterior knee. She went to several doctors and was prescribed anti-inflammatories and told to ice the area, which did not offer pain relief. X-rays of her knee were normal. Her prior diagnoses included exacerbation of osteoarthritis, tendonitis of the knee and “strain.” Even six weeks of physical therapy did not help and JH noted that it may have made her feel worse. An orthopedic surgeon ordered an MRI of her knee which came back as normal. He administered a cortisone shot which helped JH for a few weeks, but then the pain came back. Six month after her original injury and after these unsuccessful therapies, JH came to Caring Medical (the author’s clinic). She stated that prior to coming to Caring Medical, nobody even examined the back side of her knee. She maintained her primary problem was on the posterior and lateral side of the knee. Besides exhibiting severe tenderness to palpation on the posterior fibular head, she also exhibited a positive posterolateral drawer test. No external rotation recurvatum was present. JH was treated with Prolotherapy to her arcuate ligament complex. She received a total of three monthly treatments to resolve her pain. Before Prolotherapy, her activity was limited to just walking, whereas now she has no limits, as evidenced by a recent pain-free hike up and down several miles of hilly terrain. Prolotherapy to the arcuate ligament would involve no more than injecting the proximal and distal attachments of the ligament were it not for the close proximity of the common peroneal nerve. 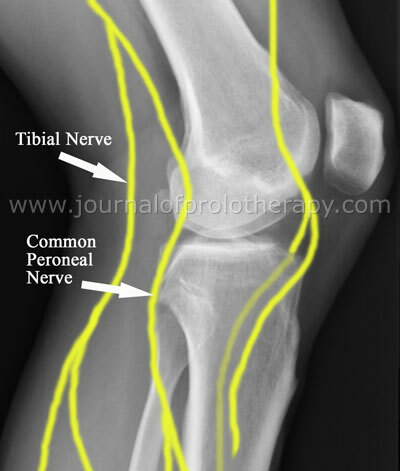 The common peroneal nerve is located on the lateral side of the popliteal fossa where it descends obliquely to become quite superficial along the posterolateral fibula. It then takes a sharp turn around the fibular neck and divides into the superficial and deep peroneal nerves. (See Figure 2.) So extra caution must be used with any Prolotherapy treatment along the lateral or posterior part of the knee. Thus, Prolotherapy to the arcuate ligament is done very slowly with great care, in addition to letting the patient know of the risk of peroneal nerve injury during the procedure. If the injection is done very slowly and the nerve is just “tickled” then injury risk is minimized. Figure 2. Common peroneal nerve anatomy over an X-ray of the knee. The common peroneal nerve lies very superficial posterior to the fibular head. In palpating the structures of the posterolateral knee it is important first to mark the location of the posterior fibular head, as this will be the most likely location of the peroneal nerve. First injections are given on the tender area of the arcuate ligament on the lateral condyle of the femur. (See Figure 3.) At Caring Medical, I typically start with a 15% dextrose solution with some anesthetic and use a total of 10cc (one syringe) in 4-6 injections in this area. 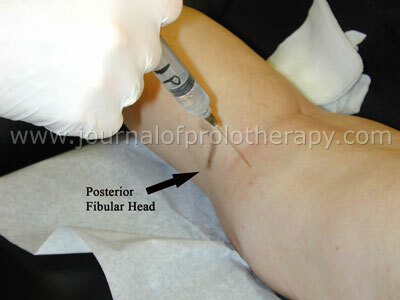 Next, the area around the posterior fibular head is injected with 3-5cc of the same solution with a 25-gauge needle. (See Figure 4.) If paresthesias are encountered, they are noted in the chart, with as much description of the location as possible, so in the future, the exact location of the person’s peroneal nerve will be noted. Generally, patients are seen every four to five weeks and need a total of two to four visits to resolve their pain and symptoms. Figure 3. Prolotherapy to the lateral femoral condyle. The superior fibers of the arcuate popliteal and oblique popliteal ligaments attach here. The posterior fibular head is noted because of the location of the common peroneal nerve. Figure 4. Prolotherapy to the posterior fibular head. These injections are to the attachments on the posterior fibular head of the arcuate ligament complex. 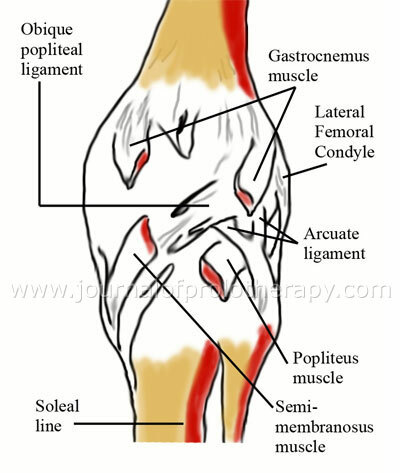 These injections must be done slowly because of the proximity of the common peroneal nerve. Posterolateral stabilization with Prolotherapy is a good treatment option for patients with arcuate ligament complex injuries. This condition is commonly missed and often occurs with more well known conditions such as anterior cruciate ligament injuries. Prolotherapy to the arcuate ligament and other posterolateral structures must be done slowly and carefully to avoid the common peroneal nerve. Typically, patients need two to four visits to resolve the problem. 1 Recondo JA, et al. Lateral stabilizing structures of the knee: functional anatomy and injuries assessed with mr imaging. RadioGraphics. 2000;10:S91-S102.